Taps are one of the more affordable elements and are no longer just functional items as they now also contribute to the style and character of the room. They are the main focus of your bath and basin and bring your design scheme together. Water has never felt so luxurious with the number of taps offering features such as waterfall spouts - and many taps come with matching showers to complete your look. 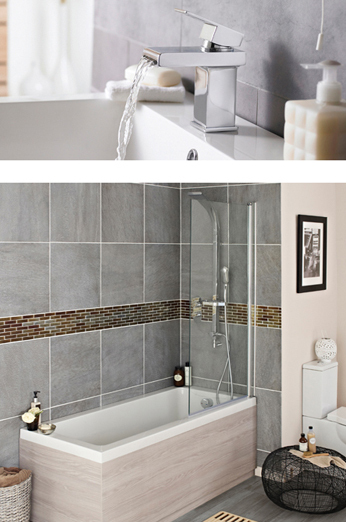 As the bathroom can be damp and humid, it can be a real problem finding suitable decor for your bathroom. For years people used shower curtains in the bathroom and these can still be seen within traditional ranges, but the reality of a curtain in such an environment is not always practical. A bath screen is the modern solution, as glass compliments any suite and with its easy-to-clean surface, there is no better option. If you have a matching bathroom suite, then replacing the whole thing can be costly, so perhaps consider just replacing the toilet seat. Just like taps, these are much cheaper and can be easily changed. Perhaps it just needs a lift with a new white finish or opt for a more natural look with a wooden seat. If you have bathroom furniture, a matching toilet seat may be available and the majority of modern toilet seats come with a soft close feature meaning they are much more durable. If you are looking to modernise whilst also gaining some storage, consider getting rid of your current basin & pedestal. A vanity unit doesn’t take much more room up than your existing basin, but gives you much more storage. Bigger changes will need more consideration and the advice of professionals. If you want to go all out, there are some amazing products to modernise your bathroom, such as shower panels with body jets and LED mood lighting, along with mirrors with de-mister technology, speaker set and digital clocks.